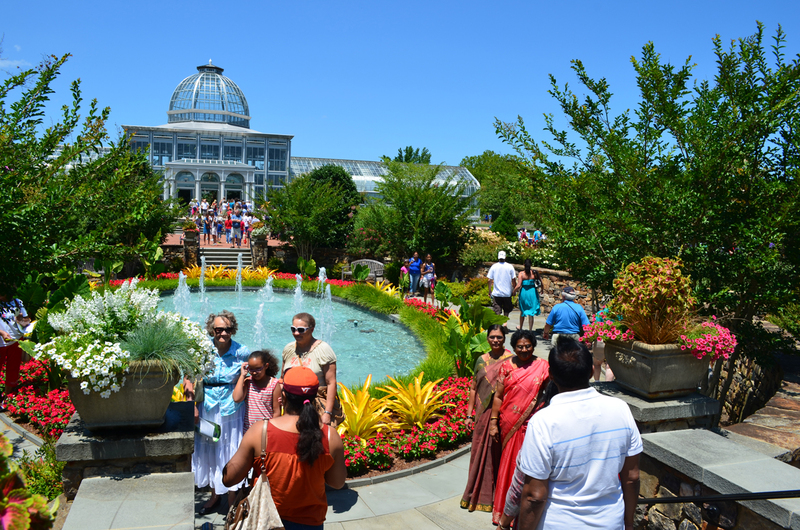 Lewis Ginter Botanical Garden and Genworth are pleased to announce Genworth Free Community Day at Lewis Ginter Botanical Garden on Labor Day, Monday, September 2. All visitors receive free admission from 9 a.m. to 5 p.m.
Free admission also includes entrance to the popular Butterflies LIVE! exhibition, Nature Connects®: Art with LEGO® Bricks, and The Art of Play. The Library will be open 10 a.m. – 4 p.m. — a great place to rest and cool off! What to Bring: prepare for a warm day! Bring water bottles & sunscreen; wear comfortable shoes and clothing. Lawn chairs and blankets are allowed. Parking: Carpool if you can! Parking is limited and once lots are full, the Garden will close gates temporarily. Gates will re-open once space becomes available. We appreciate your patience; our security staff works hard to ensure everyone’s safety. If parking off-site, please be considerate of our neighbors and do not block driveways. WaterPlay: We have sprinklers in WaterPlay, it’s a great way for kids to cool off. Plan Your Visit: Many people head to the M&T Bank Butterflies LIVE! exhibit first. Please be aware the Butterflies Live! line will close at 3:30 p.m. so that we may get guests through the exhibit by our 5 p.m. closing time. Here’s more info for planning your Garden visit, including accessibility. We’ll have extra Garden staff and volunteers working, so look for us — we’re here to help! Photography of visitors, events and activities at Lewis Ginter Botanical Garden for Genworth Free Community Day are taken for promotional and editorial use to advance the mission of the Garden. Your attendance at this event implies your consent to display and/or publish any photographs in which your image appears.